1) in the game, was the hotel xy worked at trying to rip off customers just like the show? 2) was there a xiao hu in the game? I recall someone visited the island before xy, but I forgot who it was in the game. 3) in the game, there were two sisters wearing blue, were they trying to marry xiao yao just like the show? which one is older? the one in the dress or the one in the chinese clothes? 4) was there a seed in the game that xy gave to ling'er? Last edited by ryshi on Fri Dec 28, 2007 3:22 pm, edited 1 time in total. > 1) in the game, was the hotel xy worked at trying to rip off customers just like the show? > 2) was there a xiao hu in the game? I recall someone visited the island before xy, but I forgot who it was in the game. > 3) in the game, there were two sisters wearing blue, were they trying to marry xiao yao just like the show? which one is older? the one in the dress or the one in the chinese clothes? Also, in XP version it seems the one with a basket was kinda jealous when Li was about to leave with Zhao Ling'er. > 4) was there a seed in the game that xy gave to ling'er? btw, for the drama I think by itself it's not as good as the game, but at least it introduced PAL to the majority rather than only gamers. Last edited by Whistler on Wed Jan 02, 2008 5:26 pm, edited 1 time in total. However I was quite disappointed when I saw the drama. Except some good parts of the story, for most of the time I used Fast Forwarding. I'm not disappointed due to the original story was altered or changes to the personality of characters, but this was not an "interesting" drama. PAL's story was single-lined due to the requirement of the game, and it needs to be spent very much on for improvements and completion, but in the final result there are very few fascinating parts, what I have seen was nothing but boring plots which are full of childishness (such as Ah Nu's falling into the bottomless pit, Xiaoyao's going to whorehouse [with Liu Jinyuan] and stealing Shi Zhang Lao's money). There were also many confusing plots (for example, most of the minor roles on the way were disguised by the members of Bai Yue Cult, and what they were doing was impossible to achieve their goal, which is capturing Ling'er, and I don't know why they want to do this). Wow thanks whistler, nice translation! quick question, is xiaohu that little boy? 1) Yes, definitely! Because wine is expensive, Xiao Yao and his aunt added water to the wine to save money. XD The Miao people were not happy when they drank it because there wasn't much taste. So yes, they do tend to rip their customers off. But, eh, what can you do when you're poor? 2) Yes, there is a Xiao Hu in the game and yes, he went to the island before Xiao Yao to ask for medicine to save his dad. However, the Xiao Hu in the game is only eight years old. 3) The younger sister has a crush on Xiao Yao and the older sister doesn't. I know that the younger sister has a crush on him, but I'm not sure if she actually thought about marrying him, as that was never mentioned. 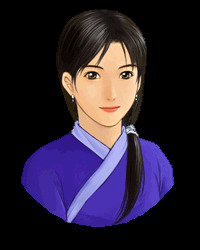 This is the younger sister, Dīng Xiù Lán. And this one is the elder sister, Dīng Xiāng Lán.